1. Too many monsters are able to cast forest prison. You get somewhat moody when your whole party is frozen and gets slowly slaughtered. I haven’t found a good antidote against it – except the usual: spread out, kill fast, endure and hope for the best. Which actually works. 2. The summon portals. Handling the summon portals is the key to success in this mission. Luckily the summon portals only start to spawn when their direct predecessor is destroyed. In this article I will call them SP1 (in S9), SP2 (in L9), SP3 (in G9) and SP4 (in B4). I tried several strategies to apply this information to good use. The usual sequence of tackling them would be 1234. That leads to a huge amount of spawns at SP4 because the distance between SP3 and SP4 is larger than usual. And you don’t want spawned mobs at that place. Because if you approach it chances are that the prespawned monsters of the boss area and the bosses themselves (there are two of them) will come and disturb you while the spawned monsters aren’t dealt with yet. Much better is 1243. SP3 for whatever reason only summons every 7th turn after the Three Gateways Patch. So you can position one mass damage dealer (like cannon main or sheriff) with your oracle behind SP3, ready to take out newly spawned monsters while your catapult and your remaining damage dealer kill the monsters before SP4 and finally take out SP4 itself. After that you destroy SP3 and then march into the boss area. While that strategy was mandatory before the Three Gateways patch, when SP3 summoned every 3rd turn, it is not necessary anymore if you can kill normal monsters with one shot (if sethed). Then you are fast enough to take out the summoned monsters of SP3 and advance straightaway to the boss area, killing all in your way and letting SP3 and SP4 stand. The next summon will occur 7 turns later and the monsters need time to reach your base, so you have about 12 turns (even more if you are lucky) to finish the mission. 1. Approach the stockades. Don’t touch SP1; kill all monsters with your cannon main that you can reach instead. 2. Breach the stockades. You get a cut-scene, and yay! This time (only this time) you get a double turn! Remember: usually you get no double turns in African missions. 3. Clear remaining monsters around SP1. Then position sheriff and oracle so that you can easily wipe out new spawns of SP1. 4. While oracle and sheriff remain at SP1, advance with cannon main (and if you want, carefully with your catapult) and try to kill the monsters on the way to SP2. 5. Move cannon main and catapult back, so that they can bombard SP1 (they stand now between SP1 and SP2). Move sheriff and oracle so that you can still control spawns but also in direction of SP2. 6. Destroy SP1. You get a cut-scene but no double turn. 7. Advance to SP2, clear all remaining monsters. 8. Only start to destroy SP2 when your group is behind SP2 (on the way to SP3). 10. Clear remaining monsters around SP3. Position sheriff and oracle so that you can easily wipe out new spawns of SP3. If you can hit hard enough: clear the fresh spawn and advance to step 14, letting SP3 and SP4 stand, otherwise proceed with step 11. 11. While oracle and sheriff remain at SP3, advance with cannon main and catapult carefully. Kill the (very few) monsters on the way to SP4. 12. Destroy SP4 as soon as your range permits it. 13. Move cannon main and cata back to SP3, destroy it. Now the main part of the mission is over. 14. Advance to the area around C2/C3. Probably (at least) two monsters will rush you. Let them. Kill them. Don’t be hasty. 15. If you are lucky only one boss will approach you. Kill him, then kill the other. General advice here: You have a large free space behind you. Use it, retreat, regroup – but if SP3 and SP4 still stand, keep in mind that monsters of SP3 will spawn eventually, and if you are unlucky some of them will walk to your base. 16. After both bosses are dead, clean up remaining monsters and destroy the Spirit Altar. It has only about 2k hp, so it should fall after one hit from your cannon main, cata or sheriff. And with chance even from your oracle. Traps: Personally I found only two traps. But there are reports around of more than these two. As usual hints from you where the rest hides are very much appreciated. After the Three Gateways Patch the trap locations seem to have changed, so don’t rely on the trap map too heavily. I will edit it when I know the new locations. I want to ask something. 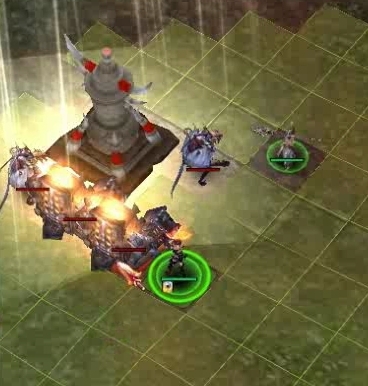 At the first summon portal can you stand behind the barrier and use cata and cannon main to destroy the gate? And at the altair can you lure the bosses to kill them one by one. At the first summon portal you can stand behind the barrier and use your catapult – but not cannon main. And only if you have fully upgraded. I am unsure about luring the bosses. I will try it some other way, but the problem is that they stand very near to each other and seem to see an attack on the other one as an attack on themselves. I got ZKLegend point about luring the boss, luring doesn’t always mean attacking them first. Just stand on the last square of the boss sight and they will come to you. i’m not quite sure about how much square of their sight cause as a cannon main i usually dont care about that. So when the boss is aggroed and attacking your “lure”, Moving backward a little so the boss keep chasing “lure” and suddenly he just stand alone to fight against your troops. ok theres some confirm that at 3rd gate theres a Net trap…if ur not careful.. Thanks, I try to verify that today. Claudia has almost all +10 gear if I’m not mistaken or at least his TBS mercs are geared up really well. The video above shows my TBS merc gear (right at the beginning). The gear of non-TBS mercenaries is much inferior, of course. Weapons are evil+10. Armor is about dg+10. Other parts vary. My sheriff wears a +10 evil chain helmet, but that was a freak accident. I tried to repair with safe enhancing a +5 helmet, got +9 and said “what the hell”, tried a second time and then – bang! Ok, what about those of us who don’t have a cowardly cannon? It may be the most powerful TBS weapon, but the Saw is THE most powerful weapon in the game. What about Bow mains? What about Sword? These aren’t covered and I’d have to say you’re biased by putting up only one version(weapon) on how to do this. If you’e going to put up a walkthru on how to do something, cover EVERYone, not just one type and expect everyone to be able to do it. 1. I can only cover cannon main and musician main, because that are the only one I have played. I have no intention to change my chars in the foreseeable future. 2. Yes, I am biased. 3. I don’t know how do you justify your last sentence. Why should I cover everyone? I really don’t want to. And I don’t expect everyone to be able to do “it” (only cannon mains and to some extent musician mains). Whatever “it” is. If you aren’t satisfied with which this blog has to offer, please, please, go elsewhere. And please don’t comment here. I know you’re probably gonna find this out for yourself if you haven’t already. Mobs at first portal act differently after “Gates” patch. They now crowd together out of range of the cannons. In order to attack them, you have to break the barricades and move forward. The two times I tried after patch, there was about 8-10 mobs. Seems like they’ve been programmed to attack the base. Once barricade came down, they stormed towards base. I think the spot they hang out before barricade comes down is the “closest” they can get to the base. Change tactic and rush out of base area as soon as possible to prevent a mass pile-up of mobs. Also, summon portals seem to summon at a different rate. Not sure what it is, but portal 3 is super slow now. I ran to portal 4, destroyed it and came back to destroy 3: it summoned 2x that whole trip (took about 12 turns ish?). At least you won’t be surprised by this when you run it. Also, don’t think that because gate 3 spawns slower now that gate 4 also spawns slowly. I think they doubled production on that one. I tried taking out 3 and 4 at the same time and got overrun by mobs at gate 4. I ran out of time with a total of 150+ mobs spawned. Still have to do the 1-2-4-3 method you described above. 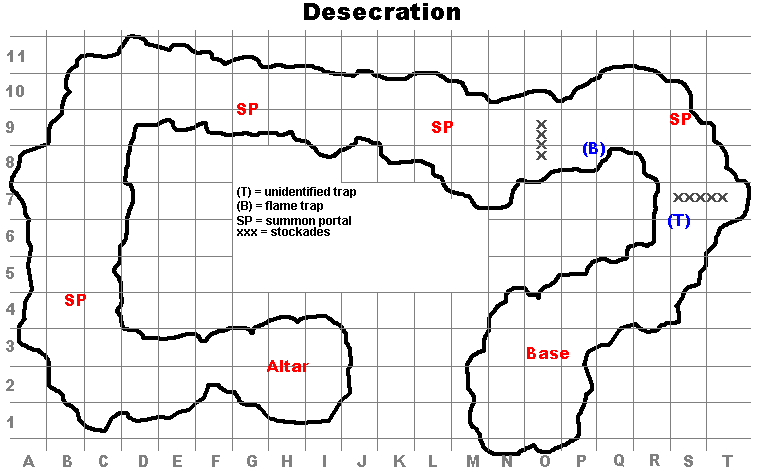 If SP4 started to summon faster, it can be a good spot for farming mobs. Problem is it is too far away from SP3, while you can destroy SP4 from range with cata, you cant kill mobs with cata… Maybe putting some traps just in the breach in the stockades will give us time to come and farm/kill the extra mobs? what minimum equipment to run solo squad, i try with main canon ( evil canon +2 , LA +1 ) , sheriff ( DG LA +3 , Evil Rifle +2 ) , Oracle ( Evil robe +2 , Staff +1 ) still difficult to make it,,. Your sethed sheriff should be able to kill the (normal) enemies in one shot. I doubt that that is possible with an evil rifle+2 but haven’t tested it. Oracle and cannon main should be ok. There is no easy way – ok, there is one: buy a Tarkan/Attila. She cannot be frozen. But otherwise you should progress carefully. When a spawner is killed the game shows the situation around the next spawner. Remember where the forest-prison-monsters are. just hit lvl 136.. and will try this mission as soon as I have enough information about it..
+7 evil cannon, +4 evil gun armor set +3 and +2..
Did the mission today second time. First time I was wiped in front of SP4 because the mobs were too much. then today I tried it with 1243 strategy and it worked really well. btw: Attila equip: DG Armor+5 all other parths +3. It’s pretty difficult to take on both bosses at the same time. I’ve got a friend (cannonM) who’s pretty decked out, but can’t finish this due to the double boss aggro issue. The best you can do is hope to lure 1 boss away from the altar. I’ve tried to do it two ways. For me, I have the most success by luring the non-cannon boss along the inside corner C4/C3 (1 square at a time). By “most success” I mean…I’ve managed to lure one of the two bosses this way 80-90% of the time (rough estimate). I’m a BW staff main.